There were a few pictures this morning that came out like this, of Parker lying down and Hudson staying close to him. Not every moment, but. We knew everybody was tired and that the little ones weren’t sleeping well in a strange place. But it turns out it was more than that and that Hudson knew his brother needed a hug: Parker wasn’t feeling well and it became obvious on their way home from the airport. Breakfast was fruit and homemade lemon curd and waffles and maple syrup at Michelle’s; dinner, lasagna here. But before any noodle anything, the important part: Parker wanted to pick an apple again. Never mind that they could use another two weeks, the Fujis are good enough now since they needed to be and so we went over to the tree. I didn’t have the scissors with me so it took a moment to get the tape out of the way and I managed to take a few leaves off getting that clamshell disentangled from the limb. Parker pounced on it as it fell and examined every inch of the insides: no apple! How…? It was still on the tree. I pointed it out and since it was, as the phrase goes, low-hanging fruit, he got to pick it all by himself. Hudson, meantime, approved of the rocking chair. And I can just picture some future visit when Parker is not going to get to pick an apple because it’s the wrong season. Hopefully there will then be something else ready for him, Meyer lemons if nothing else because there’s always one of those hanging around. Mind the thorns, though. I told our kids that I didn’t know what their luggage situation was like and whether they’d rather I mailed it home to them, but either way, if it was alright, I’d made this blanket for Hudson so he too could have a soft cushy one for doing faceplants off the couch into. I asked Parker if it was okay to give his brother a soft blankie like his. He gave it a quick looking-over–darker green and a different pattern–and was quite fine with that. And then it got ignored as sleepy things do while toys got played with and Parker helped me pick apples (don’t forget the scissors to cut the tape around the clamshells) and those apples got sliced and handed around and lunch got eaten and bubbles got blown as little boys danced. Turns out Hudson had had a bad night being in a strange place and after falling asleep on the plane and having to wake up again after they’d landed and he was tired and so was his mom. She scooped him up to go set him down for a nap. That toy in his hand just wasn’t enough in that moment. I quickly grabbed the green woolly softness and hunched down to be eye to eye with my 16-month-old grandson. He gave me the saddest face in the whole wide world and nodded and said, “Uh HUH” and reached out to my outstretched hands, then snuggled his face into it on his mommy’s shoulder, holding it and her tight. His first sentence to us ever. And with that it was his forever. Amazing how moving a ton of stuff out of a room can transform that room. The basics are now back in, post-carpet-cleaning, but it’s quite different now. And it’s staying that way for awhile. Sometimes you just need to see how it could be to get to where it should be. And did a far better job than anyone else ever has. They squeezed us in for the sake of our coming family and didn’t even give me an estimate on fanning the rugs dry; no time, they were off to another job. Don’t put the furniture back for eight hours and cover your feet with something newly clean if you have to walk on it. Other than opening a window, we didn’t. The house is readier than it was yesterday. The green-cleaning carpet guy comes tomorrow, safe for kids and pets and all that; bit by bit, we’re getting there. I could use a good long break with my feet up and my wool in my hands. But now that I’ve gotten my to-do list (mostly) done for the day, this particular day is done. I was going through things, as one does before guests come, and (as one also does, distracted) I opened a book. I had given it to my sweetie for Christmas: hey look, a Dr. Seuss we’d never heard of! It was a collection of some of his older stories, published in magazines before he’d made it big as a children’s author, many almost lost to time. A chance request to him for a new copy of The Bippolo Seed just before his death propelled the recovery of the old work, helped by a scholar specializing in all things Seuss. Charles Cohen recounts in the forward the various art and writing the man was doing in his early life. His first children’s book was turned down endlessly and Wikipedia quotes Geisel as saying that he was walking home to burn the manuscript when by chance he ran into an old classmate, who got it published. But that was all just a sideline. World War Two changed Geisel’s direction. He felt the indoctrination by propaganda of Japanese and German children was a crime against humanity and he wanted to do something about it, and he started writing a lot more for children. Doodling to change the world. Some of his books rhymed, most didn’t. On the way there, the couple’s little boy (let’s call him Little Danny Lou Who), who was not much more than two, or at least not yet three, happily recited Thidwick the Big-Hearted Moose for his new audience, showing off exuberantly the way kids do. While the childless Geisel marveled–how did a kid that young do that? It was the sounds of the words, the bouncy bounce of the rhythm, me, I would say the musicality of them, reinforced by all those drawings made for celebrating–it changed everything. One young mom at church was telling me her two-month-old woke her up at 4 am. She happened to look at her phone while she was nursing him and had this shocked moment of Wait WHAT? Half an hour ago?! She’d lived in California five years now and had never gotten to experience an earthquake. (You want a Goldilocks one: not too hard, not too soft to feel, just right for being able to say you’d gone through one but with nobody getting hurt.) Even with an infant to wake up and to wake her up, nope; they’d slept right through it. Seems the ones around here who did wake up all had bedrooms on an upper floor. At ground level like us, nope. Still, a lot of friends and relatives sent us messages today asking if we were okay. I found a business card fallen on the floor and that seems to be the extent of it at our house. So, one of the things that happened this week. We refurnished our living room and family room with heavy-duty futons sixteen years ago from a local chain that makes their own mattresses: local hands, green materials including wool and rubber and a far cry from the flimsy, thin-padded hand-me-down we palmed off on a starving grad student before our order arrived. 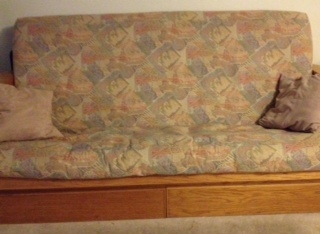 My mom once called this queen-sized futon the most comfortable hideabed she’d ever slept on. And the armrests lift up to show hidden storage compartments. Great fun, especially to small grandsons. But when we were ordering, I said to the salesman that I just didn’t love any of the fabrics they had to choose from. He said no problem, for $80 each they would sew to order whatever fabric I might buy somewhere else. The factory was in San Francisco and the company truck went back and forth from there to the store once a week anyway so no big deal, just a little bit longer of a wait for me. That took me on a hunt far and wide for the most perfect upholstery fabric; I knew I was going to have to live with it a long time day in day out and I wanted to like it. I found a large, independent fabric shop in a rather dicey area of San Jose, the parking lot a memorable slalom course between deep potholes (that strip mall has since been torn down) and they had a lot of mill remnants and a lot of upholstery fabric. I really liked a particular one and bought all that they had, I think a bolt and a half: that gave me enough for the two couches and the two chairs and a footrest cushion and one more chair should we ever want to go back and buy another. (We didn’t). …I didn’t want to admit to disappointment. The lighting is always different in the store. I expected more vibrant colors in the covers, a little more peach and not at all mustardy like how they are in low or indirect light–which is, like, almost always. Oh well, it was what it was and hey, I’m the one who picked it out. And Richard likes it. Fast forward to two days ago. I’m not going to be able to get that one carpet replaced before the kids come next weekend which is just as well because that means I’m going to take the time to get the color I want, not just what the flooring guy had in stock right now. Part of me flinched at cutting a sample off the end of the old bolt that is still tucked away behind the futon but c’mon, fer cryin’ out loud, I’m not going to order a new chair now and certainly not in that. And I looked at that seven inch square. And I looked at the couch. What do you mean, they don’t match? This is what it was MADE from! The couch was lighter. Well, okay, it’s been exposed to light for lo these many, you’d expect it might well fade some by now. I flipped it over and put it up against the furniture again. And suddenly all was clear. The trapunto pattern hadn’t been stretched out flat by being pulled across the mattress. The color hadn’t become faded. The pattern did match. They had sewn every single one fabric wrong side out. And it had taken me sixteen years to figure it out. All those years, all that suppressed disappointment, it didn’t have to have been. I was staggered. It was funny, I knew it was very funny, and I walked away from it into the other part of the house where I didn’t have to see it and fought tears for about five minutes. All that I’d wanted that fabric to be, it had been all this time just where nobody could see it. The seams had surely been serged and were long since made unrecoverable. The other thing? That fabric shop had also had a bolt of Christmas-y fabric on total closeout, pretty and sturdy and nice enough not to be (too) kitschy. (I hope.) Festive for kids and all that. Although, I dunno, I haven’t looked at it for a long time now. That bolt’s been behind that futon too, unseen, not in the way even when you pull the futon out for a bed, so it was easily forgotten. We had spent all the money we had to spend that year and those mattresses were crazy-heavy to deal with, much less twice per holiday, so I just never did get that second set of covers sewn. I remember every year about mid-January that oh, yeah, well, maybe next year. Nobody gets Santa inside out. I mean, they don’t. Right? I’m too tired to think straight, so I think I’ll just leave you with the fish cannon that’s supposed to help salmon get past some of the higher dams on the Columbia River. Just a little more testing first. Oh and. The Copyright Office has decreed that when a macaque monkey steals your camera and takes a selfie, no copyright accrues to the photographer (David Slater in this case). I’m glad he was able to retrieve his equipment, at least. That face is straight out of Disney. Made a quick run to Costco for milk and orange juice–sound familiar?–and the glass-faced curio cabinets were nowhere to be seen. This, meantime, had been at floor height Saturday, but now it’s not just above bumping-into height, it’s tied in place. Well done. And here on the home front. I noticed a few leaves knocked off the Page mandarin and wondered which genius squirrel thought that was a tree worth climbing with nowhere to go from there. I went to snap a picture or two of its growth of this past week; there’s been enough that you can see it clear from the window. Somehow I had never, not in the unpacking, not in the planting, not in the earlier picture taking, not in the watering, not in a week of obsessing happily over my new tree, had I seen what Four Winds Growers had given to me. I had told them this story and I guess they wanted to get me my first taste of my own Page as soon as possible. It had been 37 years. Thank you thank you thank you! Maybe that squirrel (if it was a squirrel) wasn’t so dumb after all. Having met my husband when I was oh, about a week old…. We were talking (again) about maybe putting in hardwood floors (we wish) when we started reminiscing about the ones we’d grown up with. Waxing the floors was a big chore whenever it had had to be done. I told him my grandmother used to make it a game for her kids, putting the wax down and then having them slide across the floor, sock-skating on the newly slippery-slip. Till the day my mom kept right on going right on through the window. Oops. “Like mother like daughter,” says he. Busted. We were both chuckling. I guess when we’ve known each other all our lives we just plain can’t get away with anything, huh. Parker and Hudson are bringing their parents to play with us next week. We have floor-to-ceiling glass all over this house and y’know? Carpeting might not be such a bad idea after all. So someone asked why kids actually need that. And, with thanks to my sister Marian for the links, the answer is that the more kids move, the better developed their sense of balance and strength and their sensory system. So someone did something about it. I dearly wish Bouncy Bands had existed when I was a kid in the classroom. No noise, no distraction to others, no leaning back in the chairs because your feet are already busy, lots of energy expended. The inventor did anticipate kids using them as rubber bands and counsels the teachers to head that one right off from the get-go. A rubber half-band for your feet to fidget on. Y’know? I could actually put one to use on this chair, come to think of it. And then someone would have to invent a Fitbit-type gadget to count the calories expended from all that. Silicon Valley: on your mark! Get set! GO!!! Because I think the inventor of these bands just made himself a billionaire–these are going to be everywhere. I sure hope his patent gets granted quickly. He earned it. 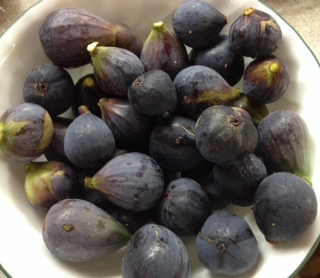 I was plan ning on writing about figs. Friends shared the bounty of their tree and my tall Richard helped pick a few higher-up ones for the others with his feet still on the ground. I always enjoy it when he does good simply by being tall–something he didn’t choose, it just is. Like the color of his skin. I haven’t mentioned the news of late because I felt nothing I could say could be enough and at the same time I simply wanted there to be one place on the Internet where people could rest from all that for a moment to read about, oh I dunno, mandarin trees and Costco shoppers playing falling piano to my roadrunner. Or whatever. And yet some things require they be addressed. I feel John Oliver has done the best summing-up so far of Ferguson, Missouri. Daily Kos, meantime, reports that Tibetan monks arrived there to represent for peacemaking, knowing that sometimes simply observing people often improves their behavior in ways that transcend the barriers of language. The whole issue of the over-militarization of our police is being shown and borne on the shoulders of those who have the least but whose power is that they may yet change our nation for the better for what they are having to endure–the huge betrayal by those who swore to protect them, the betrayal too by those who give in to their anger late in the nights and allow the rogue forces to justify themselves. There is the utterly innocent black man beaten by them before Michael Brown, who was charged with destruction of city property for bloodying the cops’ uniforms with four officers later lying during the deposition against their own signed statements. Enraged at finding they had jailed the wrong black man, they’d been determined to make him pay for it. There were video cameras everywhere there, as there must be in such places, and yet somehow no recording of it could be found. One of those cops is now on the city council. All those images, all that grieving for the human spirits on both sides of that huge divide and for how much better it could have been, should have been, needs to be, must become for all our sakes…. Every person matters. You matter. Whether I know you or not, you matter to me. And that, in the end, is all that matters among us. May we so live. One is cute, 1500 is a bit Biblical. The box looked the size and type that would have, say, a pint of Ben and Jerry’s in it. There was a square cut-out in the lid covered in mesh. So I expected a mesh bag inside with, y’know, a twisty tie or something. Richard had thought that ladybugs for our yard would be a good idea, and for eight bucks towards doing good to the environment wherever they might go off to, why not, so he bought me some. Computer scientists and bugs and all that. So here he was Saturday night, flashlight in hand to help me watch my step out there (he’s a good one) as we went out onto the back patio. The ladybugs were more likely to stay in the area you put them in if it’s dark out. But it was actually pretty well lit right there on the patio side of the window and I thought I’d start with a few over at the amaryllis pots on the picnic table. I lifted the lid. And gave a small yelp and jumped back–but at least I didn’t drop the thing. I mumbled something about there were bugs in there and a mass of them were coming at my hands and okaynevermindyeahthatwasstupid. I tried to make sure they were aimed away from me at all times as we walked around playing Johnny Appleseed at nature, having no way to see if they were blowing back into our hair (don’t even THINK that!) Amaryllis. Fling! Page Mandarin. Fling! Cherry. Fling! Apple. Fling! Pear. Fling fling double fling leave the lid there too on that one and let them sort themselves out. And some on the lemon, since I hadn’t quite been able to persuade the last of them to leave the cup part at the previous stop. I woke up in the morning thinking, wow, did we just feed the birds dessert first or what? But I saw at least one if not two ladybugs on every one of the baby fruit trees when I gave them a quick check, so, so far so good. The ice cream box had little specks all over the bottom. I have no idea if there are eggs in there or if it’s all just bug poop. I think I’ll give it a few days. That I don’t have to go near it.